Clover Tool Company’s new patent-pending RD-A1 pneumatic nut and bolt rundown tool streamlines make up operations significantly and is specifically designed for low overhead clearance applications. The Clover RD-A1 thin profile hex head (no thicker than nut height) enables it to fit onto flange nuts in tight areas like those found under BOP bodies, wing valves, and elbow flanges. If the nut fits, the RD-A1 will fit. The power adjustable magnetic hex head operates up to 1200 RPMs (free spin), reducing nut rundown operation from minutes to seconds. The through-hole design allows longer studs to pass through the tool making stud length a non-issue. The RD-A1 is lightweight and simple to operate with a forward and reverse switch and lever activated. 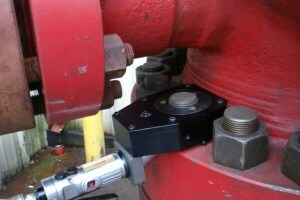 A simple tap releases the nut from the magnetic grip of the tool after a rundown and automatically picks up the nut during run up with release extensions.